Today Barnaby went up into the High Atlas mountains – way up into the hills, past the Todra Gorge and everything. He found his way to the village of Aït Hani, where he met some very knowledgeable women, Rabha and Hadda, who taught him all sorts of interesting things about vegetables and couscous and lots lots more. 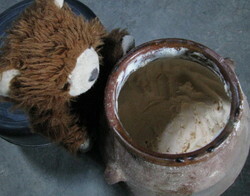 But the most exciting part was when he came across an old earthenware pot. By the smell, he could tell it was cheese – and quite strong, old cheese at that. It reminded him a bit of his adventures back in Munster, in fact. So he was quite taken aback when the women assured him that it wasn’t cheese at all: it was butter. No ordinary butter, though – this was the famous aged rancid butter they call smen. It’s kneaded (sometimes with herbs and spices), cooked (although not always), salted and then kept for years until it gets just the right taste. They gave him some with some couscous to try, and he thought it was very interesting. Four hours later, he still thought it was quite interesting, although he also still thought it tasted quite like he’d been sick in the back of his mouth. 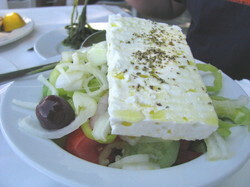 Did you know that 2008 is the official year of Feta cheese? Neither did we, until we read it in the in-flight magazine on our way from Thessaloniki to Crete for a conference on ‘the Eastern Mediterranean diet’. This strengthened our resolve to find a Feta-maker and learn all about this crumbly white cheese, which most of us know from its prominent role in the ubiquitous ‘Greek salad’. And why is it getting its own special year this year? 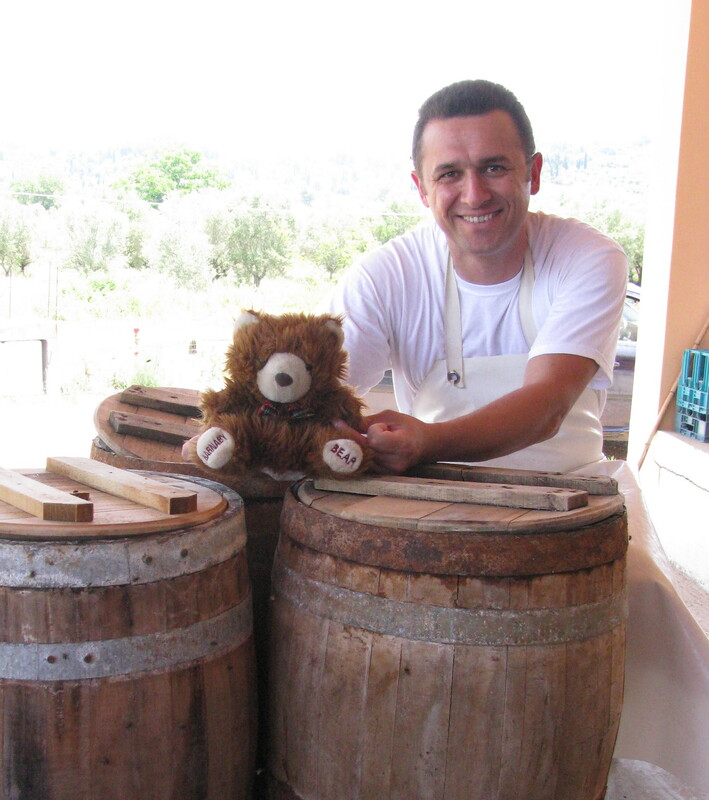 Today Barnaby met Andonis Nikolopoulos, a feta cheese maker in Floka, a village near ancient Olympia in Greece. Having already learnt about Munster in France, sheep’s and goat’s cheeses in Poland, and bladdered cheeses in Romania, Barnaby thought he probably knew pretty much all there is to know about cheese. This is not the first time that Barnaby has been completely wrong. He was quite surprised when Andonis explained to him how real feta is made by adding live yoghurt (not just rennet) to the sheep’s milk. He was even more surprised when he heard that the cheese ferments in tightly sealed wooden barrels – apparently it gives off so much gas that the barrels nearly explode when you open them! He also realised that he didn’t really know what good traditional feta tastes like – rich, creamy, tangy and salty all at the same time. He wondered about trying to make his own feta, in fact – but now that feta has protected appellation status, apparently it’s not supposed to be made by bears. He was quite disappointed, but we suspect he’ll have forgotten about it in the morning. You might not associate Turkey with dairy products in the way that you might France or Italy. 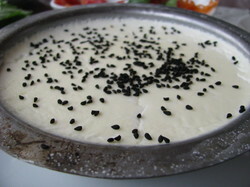 But dairy is big business in Turkey, the country which invented yoghurt and exported it to the world. There are also numerous cheeses and some very special butters and creams, and an ice cream you eat with a knife and fork. Today Barnaby went to visit the famous Bran castle in the Carpathian Mountains. The castle was closed, so instead he found a nice local cheese farmer to talk to. Nicu Solovastru has 300 sheep and 10 cows, which spend their summers grazing in the meadows high above the castle. He is proud of the fact he uses 100% natural products and traditional methods. 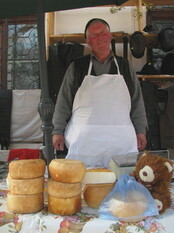 Even the cheese moulds are natural: the smoked sheep’s cheeses (caşcaval fumat), which Barnaby thought tasted not unlike Polish oscypek, are shaped in wooden moulds Nicu carves himself, and the cow’s cheeses (brȃnza de burduf) are aged in either large sheepskin sacks or perfectly round calves’ bladders. Barnaby wanted to buy a bladdered cheese but Anna and Matt prefered the smoked cheese so he had to settle for that. Domnul Solovastru has kindly invited Barnaby to come back next summer to make cheese with him in the mountains, so that will be his chance to get properly bladdered. A day without vodka has done Barnaby the power of good and he is now back on solid food. 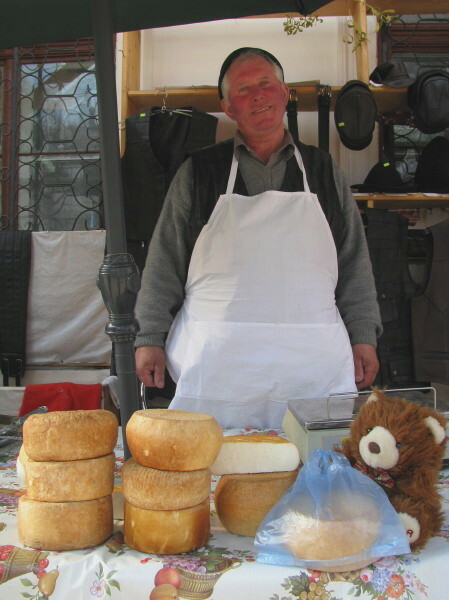 To nurse himself back to health he has been nibbling on his favourite of all Polish cheeses – oscypek (‘os-tsi-pek’), smoked mountain sheep’s cheese. 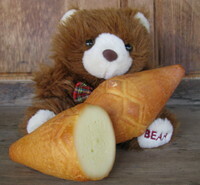 Oscypek is a speciality of the Tatras mountains around Zakopane. The sheep’s milk curds are packed into carved wooden moulds, most traditionally a spindle shape, to harden, and then hung in woodsmoke to acquire their classic colour and flavour. Apparently unscrupulous market traders paint their cheeses with coffee to imitate the authentic oscypek appearance. But this one came from an impeccable source via Richard and Marzena’s cheese lady. A good oscypek should squeak when you bite into it and have a rich buttery taste. Barnaby likes his sliced and fried until crispy golden-brown on the outside and gooey on the inside. 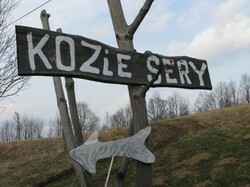 Luckily, by the time we’d reached the remote Bieszczady Mountains we’d learnt enough Polish to recognize that ‘kozie sery’ meant ‘goat’s cheeses’. (It’s great being married to a linguist.) So when the hand-painted wooden sign appeared by the side of the road we slammed on the brakes – and then tentatively approached the farm gate, while two enormous barking dogs approached us from the other side, a lot less tentatively. Barnaby made a hasty exit when the big boss goat at Zbigniew Wantula’s dairy farm caught him messing around in the barn with his 22 wives. 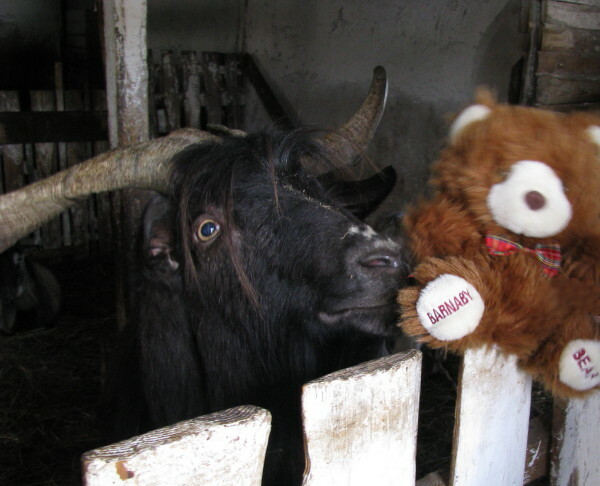 Barnaby was just being curious – he wanted to know where the delicious goat’s cheese he had just tried came from. In this far flung corner of southeast Poland Zbigniew makes fresh goat’s cheeses and feta-style aged ones. You can buy it direct from the farm, or if like Barnaby you’re too traumatised to go that close, you can get it in the pub up the road. 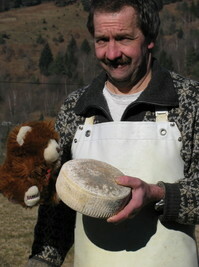 Today Barnaby met Dany Roess at his farm in Soultzeren in Alsace and learnt how to make proper Munster cheese. As bears don’t eat Munster he ended up buying a whole Tomme des Vosges instead. Yum. Anna and Matt preferred the Munster, which is the local AOC washed-rind cheese and is fantastic on its own or in lots of local recipes. Tomme isn’t as old and traditional around here as Munster (Dany says they started making it 15-20 years ago), and isn’t regulated to the same extent (you can put any herbs you want in it, including delicious wild garlic). But Barnaby liked it all the same. It’s not easy being an Alsatian cheesemaker. 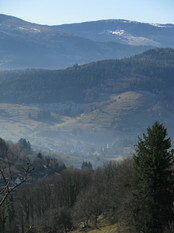 Yes, you get to live in a beautiful valley in the foothills of the Vosges mountains. And yes, you get to produce the traditional Munster Fermier, one of France’s tastiest (and smelliest) cheeses. But tradition brings rules, regulations and responsibilities as well as tastiness (and smell) – not to mention expense. And it’s not easy to make a living from cheese alone anyway. We stayed with Chantal and Dany Roess at their farm in Soultzeren, where they make Munster (amongst other things), and they told us all about what they do, how they do it, and how they see their role as upholders of the traditions of cheese.